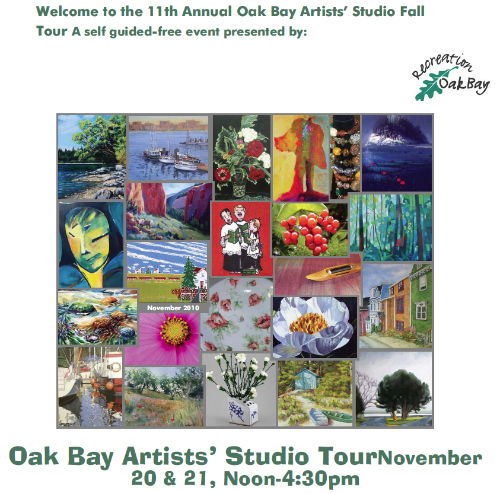 Today and tomorrow Oak Bay welcomes you to the eleventh annual Oak Bay Artists' Studio fall tour. It is a self guided-free event prensented by Oak Bay Recreation. Both days starting at noon until 4:30pm, I believe there are twenty homes throughtout Oak Bay to enjoy art. I have listed the names of the artists participating and their websites below. Leslie invites you into her studio to view her award winning paintings. Her work inlcudes figures, landscapes and poured watercolours. Retiring after thirty years as a potter, Bruce has turned his full attention to painting. Bruce lists the Group of Seven, Interpol, the National, the impressionists, Lady Gaga and home roasted coffee as some of his influences. Expressive acrylic landscapes, large and small, draw from local scenery and rendered in the restrained shades of the coast. Also a selection of paintings inspired by travels in Canada and abroad. "My work, mostly in acrylic, reflects my love of colour, natural patterns and details." Exhibition and works in Canada, Scandinavia, France, and New Zealand. Infused with radiant jewel tones and unique applications, Marion's award winning canvases portray mystery and whimsy...don't miss this "favorite" studio destination. Bold acrylic paintings and photographic works cover the walls of Pat's studio. Her explorations with rock imagery continues with new works from new stones. "No fancy words or descriptions - I let my watercolurs and acrylics speak for themselves. Come and 'see' what they 'say to you." Seasonal Cards displayed as well. Bonnie has traveled and lived in many different countries where she collected antique and spiritual beads. She is home now creating unique bracelets and necklaces which will bring health and harmony into your life. In the creative hands of Flo-Elle, the century old tradition of China painting is given life. Each piece is a permanet non-toxic and functional piece of art. "I hope to inspire studio visitors with my watercolours of "jellybean" houses of Newfoundland, equally colourful acrylics of terraced landscapes and unique, abstract monotypes." Visit Ron's Creekside Pottery Studio to find works of high quality, craftsmanship and design. Enjoy traditional favorites and special items to adorn the festive table. 12. Marshall Hugh Kaiser - 1766 Armstong Avenue located in North Oak Bay (between Cubbon Place and Cranmore Road) - 250.384.1032 A collection of dramatic seascapes in oil on canvas spanning eight years of exploration between the Atlantic and Pacific coasts. Jean's work reflects time spent weaving in Japan. She creates decorative and funcitonal textiles with an emphasis on detail. Woven, spun and dyed with natural materials. Joan invites you to come and view her new acrylic paintings-vibrant colours and a looser style. Enjoy tea and cookies too! Visit Joanie to discover the new magic she has created via her three dimensional paper castings, collages and photos of Oak Bay and beyond. New greeting cards on display. Jill paints the beauty of the local scenery with soft pastels on sanded paper. New to the Oak Bay artist community, she welcomes you to see her work. Join Ingrid in her studio, where she captures the florals of the local gardens in her big, bold, vibrant acrylics. Her canvas bouquets bursts forth with colour. Welcome! Come and enjoy Claire's vibrant still lifes, landscapes, and scenes of France, in oils and acrylics. Lots of small gems and gift cards too. Avis's chapbook, "Take Five Coast to Coast," illustrated with 2010 reduction linoprints plus other chapbooks, cards and jazz linoprints will be shown. See her U.K. paints of Winchester Galleries on Oak Bay Avenue in the Village. "Come and see my fresh, contemporary style of acrylic painting applied to our beautiful west coast forests. A work is successful if it elicits memories and emotions from viewers of their own personal landscapes." Photographic images of nature; trees, ocean, animals and flowers. Pam is inspired by the surrounding shorelines, Gulf Islands, forest paths and gardens. 22. 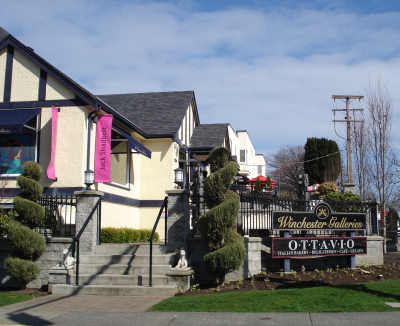 Victor Lotto - 2605 Cotswold Road located in the Uplands area of Oak Bay off Uplands Road - 250.592.3585 www.victorlotto.ca Victoria is an award winning artist who paints in acrylics and watercolours. His work is in private collections in Canada and abroad. I hope this is helpful for you, enjoy your weekend and look for the Spring 2010 Oak Bay Artist Tour scheduled for April 16 and 17, 2011. If you are looking to relocate into Victoria or the Oak Bay area please call me direct at 250.744.4556. If I can help, be happy to. Please stay tuned for more Oak Bay updates!